Step into the world of the Pathfinder Society Roleplaying Guild! 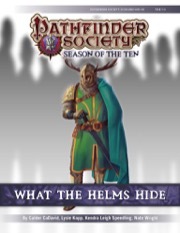 Each Roleplaying Guild scenario follows the course of agents of the Pathfinder Society, as they explore the dark alleys and political intrigue between far-flung travels in the world of the Pathfinder Roleplaying Game. Play is organized into Seasons, throughout which the actions and achievements of you and your fellow Pathfinders create an ongoing storyline. Each season consists of numerous scenarios set in a variety of exotic locations across Golarion. While designed for play in the Pathfinder Society Roleplaying Guild, scenarios can easily be adapted for use with any world. Wow, I really thought this would never happen. Also, would the 20% discount stack with the Pathfinder Advantage discount? Edit: Nvm, just checked the FaQ page (like I should have done before I even asked in the first place). For an actual question then, how many Scenarios come out each month? This one is 3 but are there usually more or less? On average, 2 per month. I'll update the subscription description info with that in just a bit. Is this...can it be... the long awaited and never expected... PDF subscription? At this time, we intend to offer PDF subscriptions solely for PDF-only product lines. There are many reasons we don't offer PDF-only subscriptions to lines that have print editions. Here are a few of them. I know - it's not even your first digital subscription - you've got one for the digital copies of the audio plays (are they still going?). But it's nice to have anyway. 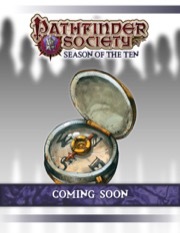 The next Pathfinder Legends AP is currently in production—I'm not sure when Big Finish will announce which one it is, though! Finally, after 8 years of waiting. I am wondering when the next scenarios will be listed. Ooh, tempting. I think I'm gonna keep buying them piecemeal since I do run very sporadically and prefer to run scenarios after playing them, but still, tempting. I had purchased 8-01 and 8-02 prior to this being released - is there a way to start with 8-03 this month or should I buy it seperately and wait to start my subscription when 8-04/05 are available? It's a shame it started for Season 8. I would of enjoyed a subscription back in Season 6 and 7. I love that there is one for people to subscribe to, it will help out the GMs specially with the 20% off. Dotting this to keep an eye out, as soon as it updates with the next scenarios, I'll subscribe. Hm. I subscribed to this on August 6, and the first 3 scenarios are in my downloads. The 4th and 5th are due for release later this month, but my "my subscriptions page" doesn't mention them — it says the next ones to ship will be 6 and 7, in October. Do I need to be concerned? Will the subscription be updated, or perhaps given an option to start with 8-06/8-07? At this point, I'm going to just purchase 8-04 and 8-05, and hope that the service gets updated sometime soon. I received an email notice on Monday that 8-04 and 8-05 were preparing to process on Wednesday (today). My experience with new PFS scenarios is that they tend to drop around 5:00 Paizo time - if they're not out by tonight then I'd worry. I've poked the subscription options to allow for this starting option. However, in order to do this it caused a display issue that makes it look like the products are available tomorrow. Do not panic, they are going to be available today. I see the Scenarios for 8-04, and 8-05 are available for purchase but they are not showing in my downloads. Also I haven't I got a notification of my subscription being processed for these 2 new scenarios. No Panic here just reporting my status. I'm in the same boat as 1bent1 (except with a wee bit of panic as I'm scheduled to run one of these in three days...). I did get a message two days ago saying that the subscription was ready to process, and would process on Wednesday October 5. We had a minor issue with the running of the subscription. We are just about to try again. Folks with the PFS subscription should have had their orders for the scenarios created and fulfilled. Please let customer service know via email or the Customer Service forums, if you have any questions or concerns about your PFS subscription or subscription order. I got what looks like a standard "auth" email, which says the order is pending. Didn't get an "order filled" or "shipped" email, but both scenarios were in my downloads, and I just downloaded them. I have to correct that. I did get an announcement mail for the subscription on October 4, but not a mail for the actual order. We are noticing that a number of folks did not get an email that their order was finalized. I've opened a ticket for this to resolve hopefully by the next time we run PFS subscriptions. If you are a subscriber to the PFS Subscription and did not get that confirmation email, check your My Downloads to see if the scenarios dropped. If they did not (there are a very small handful of folks) check your payment method on your My Subscription page to ensure it processed. Let customer service know (boards, email or phone) as soon as possible if your subscription is not right. This digital only subscription is a brand new thing for us with shiny new code and we'd love to get any issues resolved with it as soon as we can. Just as a heads up I've decided to see how it works to have a customer service forum release thread for the PFS Scenarios specifically. Here is October's: http://paizo.com/threads/rzs2tycp?October-2016-Pathfinder-Society-Roleplayi ng. I've been going through the scenarios available, and I've noticed that each season seems to have a couple of scenarios numbered 98 and 99 usually, which are "unavailable". These are clearly some kind of special deal. Are they part of the subscription? Will they ever be available for download? Also, I note some earlier seasons had a "complete" zip file containing all the scenarios for that season, available for it looks like the same price as the individual files, but as one convenient download. These too seem to be unavailable now. Is Paizo going to make these available again (and for seasons where they're not available now) or is this a dead deal? Doesn't really matter, since we can download the scenarios individually, and that may work out better for some (including me) anyway. Wow - I hadn't noticed that this subscription existed! I'm interested. One question I have though is does this just charge you once monthly with your other subs or is it charged each time a scenario is released (I don't know if they are all released at once for the month or one by one over a period of time through the month). The Q&A tab seems to be empty. Also, I second Ed Reppert's question - are the specials included? They generally release them in batches of two or three scenarios at a time. They follow their own schedule, rather than being tied to physical subscriptions. No new scenarios announced beyond those already published? That's unusual. A question, as an international subscriber, will I get the physical copies sent to me too? Will my card be charged again with the shipping cost? Awesome, thanks for the quick answer!